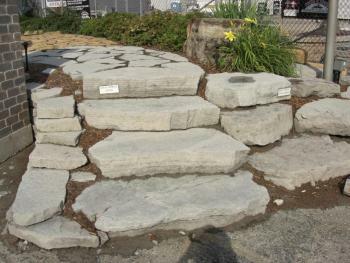 Outcropping are very large natural wallstone. They come in a variety of sizes and colors. An average size of outcropping is 3ft wide x 2ft deep x 6-10in height. Another popular size is the 2-man outcrop. This type has the same front face dimensions, but the depth is approximately 1ft deep. This will give you more square face feet per ton compared to the standard outcrop size. Adding just one or many, the effect will be beautiful. Some of the uses are: walls, rugged steps, bordering, pond layout and waterfall effects. Check out our displays to determine which size will work for you. We have all of our outcropping materials on display. Please stop by our showroom to see the natural stone in person. Use the pictures as a reference only. We have all of our outcropping materials on display.